What we think when we first look at the skin of something is never the whole truth. What looks to be a static situation may be changing in a profound way. I think of it as sitting in a seat until the right time comes to move on. Nothing on this earth is forever, and that is quite wonderful to my way of thinking. 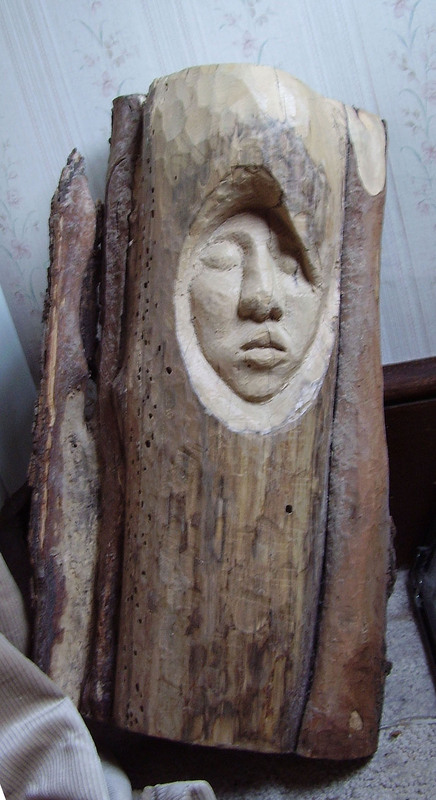 This is a carving that is resting so that it can season slowly before I work further on it. The wood chunk bears marks of some bad trauma — I suspect it was struck by lightning at some time and the epidermis, as it were, was split open. The tree healed with a layer permanently peeled back. I couldn’t pass up the opportunity to investigate some of the wood’s secrets. I found this woman in the wood. She sits on our stairway landing with her eyes appearing to open and close with the change of the light during a day’s time. She has become a real presence here. Who knows what else we pass by every day that has some amazing story for us if we will only look deeper. One of my long-time friends has written me something about my Spirit in the Wood carving that moves me a lot. The writer has been a lover of nature from her youngest days growing up in Paraguay as a child of Mennonite missionaries. Happily, she has spent a large part of her adult life in the U.S., and so I have had the privilege of knowing her. The link: Ruebenzahl yields some clues to what she is talking about I shall have to do some more investigating about this other Spirit in the Wood. My spirits in my woods have been only benign ones, so far. It’s interesting to me that the lore of some other cultures has more overt acknowledgement of malevolent spirits than the culture that I grew up with in metropolitan U.S.A. Where did awareness of the spirits go, in the good old U.S.A.? It’s a rare thing to hear about exorcisms, and I, like most, am leery of seances and such. Is it the Biblical admonition to avoid necromancers, and “not give place to the devil?” I certainly have not wanted to dabble in matters of spirits other than benign ones. Or…have I thought that all the spirits in MY woods were benign? I will hang on to that notion, I have decided, and expect that spirits that I run into will speak of themselves (as do the humans that people the world), and that I will have to stay tuned in to God, as I know Him, to sense which ones to avoid and which ones I can hobnob with. As to the chunks of wood, they all have a tale to tell, and I hope I find some other chunks of wood that ask to be opened. Surely, in the time it takes to carve something, the wood will let me know whether to persevere, or simply throw it in the fireplace. Look at this link for another “take” on the spirit in the wood. It’s about the Greenman! When you get to the site, click on Gallery> Products!